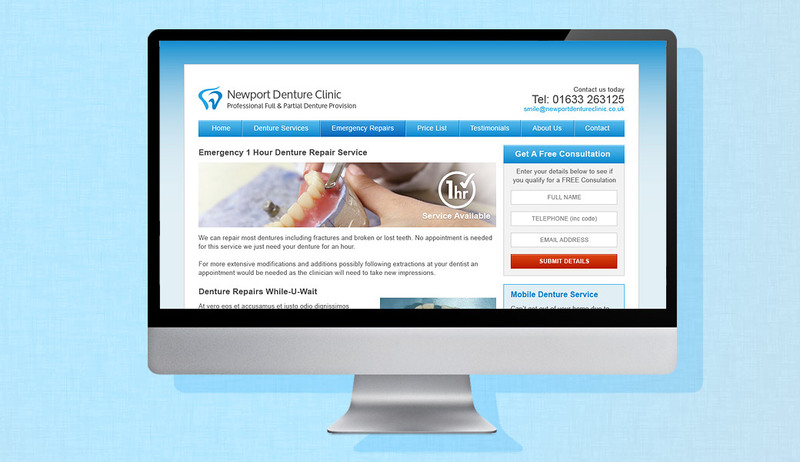 Newport Denture Clinic initially came to Netryx looking to make some changes to their existing website and Pay Per Click Services. The proprietor Steven Reynolds had had a website built at the beginning of 2012 and was running a campaign with Google Adwords Express. After looking at the website, seo and ppc campaign it was clear to us that things weren’t being done correctly and that the current web design was badly designed and poorly constructed. We proposed a new website, ppc campaign, on-page seo and copywriting which was a little over their proposed budget but necessary for their requirement. We knew the client needed a lead generating website and demographically targeted ppc campaign if they were to have any chance of online success. Our usual process for small business web design is to initially liaise with the client. We discussed what the most pertinent information is and the kinds of questions potential customers ask when they call in to the client. After we roughly agreed on content we transcribed that into a sitemap structure and rough mock-ups of the website pages. We also discussed colour schemes and the type of design that would suit the business model. The client focus was on dentures around the South Wales area. We did a whole host of keyword research and competitor analysis. Doing this helps inform the overall structure of the website as well as the content orientation. The keyword research also contributed towards the pay per click campaign we put together for the client. The keyword research always informs the way we approach seo copywriting & content creation. 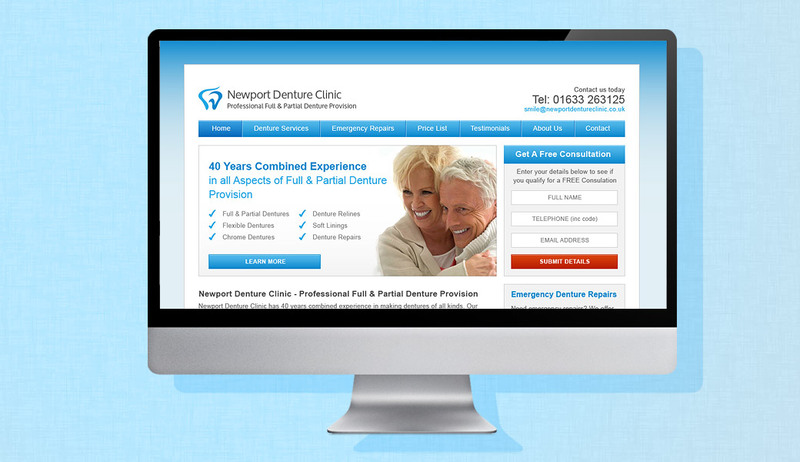 The seo for Newport Denture Clinic was no different. The content and website structure are built around the requirement of the search engines equally as much as the requirements for the website in regard to functionality and visitor experience. The client was running an Adwords Express Campaign which we would never recommend as it’s just a way for Google to cream off the uninitiated. Especially so for a denture clinic as there are too many crossovers with the dental industry and Google will just take your money. So we shut the express campaign down and put in place a comprehensive, targeted small business adwords campaign geo-targeted to a 20 mile radius around Newport & Cardiff. We took the content supplied by the client and wrote in our researched keywords right across the site including the page descriptions and page titles. This is a perfect example of an average sized website being built from the ground up with one purpose in mind – to generate leads. Doing everything set out above will ensure your web design company can factor in everything it needs to make your website the success it needs to be. The client was very trusting whilst at the same time asked pertinent questions during the process. This is important if you are to let your web agency imbue all their knowledge into the new website.